Mr. U.M.Patel, retired from the post of Chairman & Managing Director of the company. In recognition of his valuable contribution to the development of the company, the Board of Directors conferred upon him the post of Chairman Emeritus. In a farewell ceremony, the company Directors and officials reminisced about his determined crusade over a period of 60 years to give the company its status and position in the industry which it enjoys. Mr. U.M.Patel, thanked all his colleagues for their support to him in his endeavor. He also welcomed the incumbent Chairman & Managing Director, Mr. B.U.Patel who has been instrumental in the modernization and technological advancement of the company. Mr. B.U. Patel is a techno-commercial man and has led the company from front as Managing Director . The company looks forward to yet greater heights of success under his stewardship. 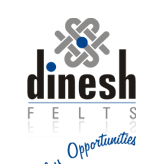 DINASORB from dinesh are 100% synthetic needled felts for Asbestos Pipe Machine felts. DINASORB which are basically single layer felts, designed for machines making asbestos pressure pipes of varying diameters. Coarse yarns for base weave and coarser fibers for batt needling to minimize clogging due to contamination and compaction. Can withstand the significantly varying tension over the felt length. The tension sometimes varying between 2.5KN/cm after the forming roll to 70 KN/cm before the forming roll.